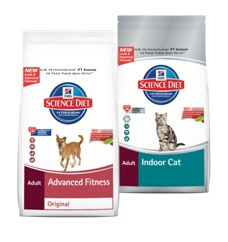 Hill’s Science Diet has announced it has begun shipping dog and cat food products containing new recipes and formulas starting in December 2012. The new formulations are being rolled out gradually over a period of weeks and should soon be available at pet food retailers. This is the first overhaul of the Hill’s Science Diet product line in many years. What’s more, as this factory tour video clearly shows, Hill’s boasts an impressive system to prevent contamination and promote rigid quality control. Thanks to a pet food design method known as ingredient splitting, it’s easy for a company to legally manipulate a list of ingredients to show any item in the first place position. That’s why it’s still important for you to take a closer look at any new recipe to determine the true amount of meat-based protein in each product. Although we applaud Hill’s decision to use natural ingredients and no chicken by-products, our current analysis suggests little has changed. And what has appears to be mostly cosmetic. The company’s posted label information shows the recipes are still dominated by cereal grains and lower quality ingredients.